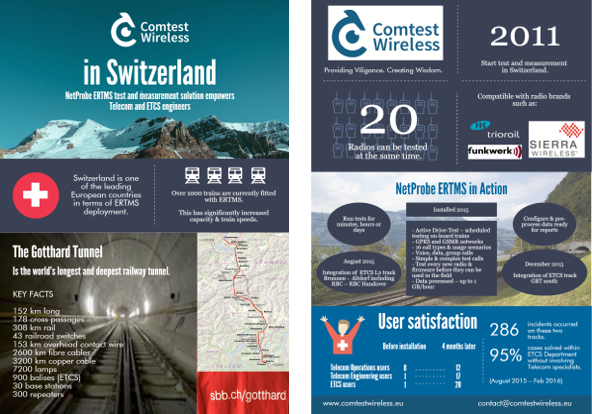 The infographic uses facts and stats to demonstrate how the Comtest Wireless drive-test solution has been used in Switzerland, since it was first introduced in 2011.
the solution is now used to test new radios and firmware before they are deployed in the field. The impact of NetProbe ERTMS solution has been impressive for the engineers in Switzerland. Within 4 months of the solution being available, the number of users in the Telecom Operations Department, Telecom Engineering Department and ETCS Department had increased from 10 to 57. What’s more, 95% of the ‘incidents’ occurring on the two tracks were then able to be resolved within the ETCS Department, without requiring specialist telecoms engineers. See the full infographic pdf here.